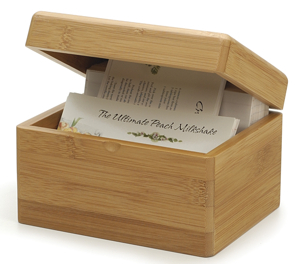 Add a touch of warmth to any kitchen with this beautiful, durable bamboo recipe box. Bamboo is the smart ecological alternative to hardwood. This recipe box will sit handsomely on your countertop holding all your treasured recipe. To clean, simply wipe with a damp cloth. I was not expecting such good quality. Interior space is perfect. Very happy with purchase.